Dozens of DeKalb County School District (DCSD) students received lessons on responsibility, planning, strategy, and integrity on May 5. Stone Mountain Middle School hosted the sixth annual DCSD Chess Fair on Saturday, May 5. While students traveled from throughout the district to put opponents in check, checkmate and constant doubt, the event also featured guest speakers, lessons in strategy, as well as life-lessons from community leaders. Five separate tournaments took place throughout the day, featuring competitors from Stone Mountain Middle, Tucker Middle, Redan Middle, Rockbridge Elementary, Pine Ridge Elementary, Woodward Elementary, Stone Mountain Elementary, Shadow Rock Elementary, as well as individuals at the high school level. 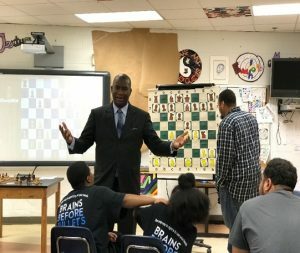 Motivational speaker Orrin Hudson of BeSomeone.org provided attendees with lessons on making the correct moves both on and off the chess board. Hudson’s lessons of responsibility, integrity and non-violence are sure to stick with attendees for many years to come.